Lewis Morrison Estate Auction — Harritt Group, Inc.
One-owner 3 bedroom – 2 1/2 bath brick ranch with full walkout basement and 2 car garage on nearly one acre lot located off Old Vincennes Road near Hwy. 150. Also selling Chevrolet Corvette, Star Cruiser Motorcycle, John Deere riding mower, furniture, household and hot tub. 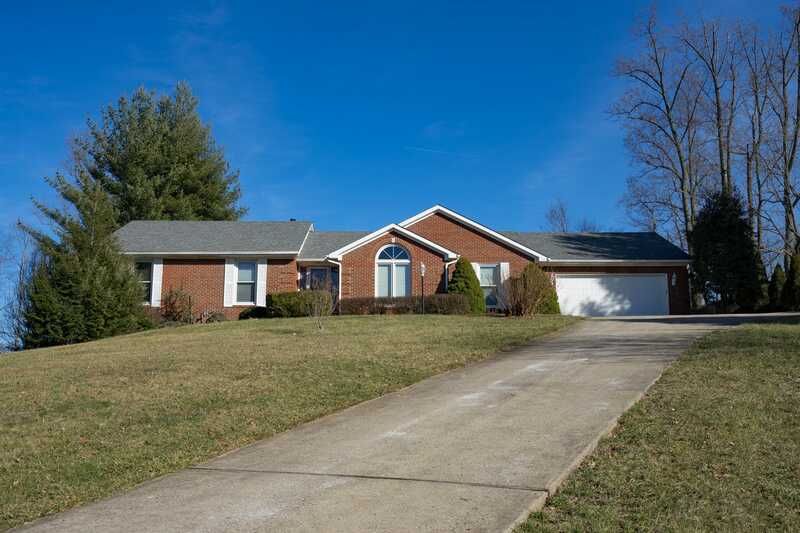 Nestled in small neighborhood a spacious 2069 square foot brick ranch plus full walkout basement and attached 2-car garage built in 1991 on .964 acre lot conveniently located near schools and shopping. First floor features 3 bedrooms, 2 baths, formal dining & living, family room with fireplace, eat-in kitchen, laundry-mud room, hardwood and tile floors, cathedral and tray ceilings, LP gas heat plus Clayton wood furnace. Walkout lower level finished with family room and 1/2 bath with ample storage area and workshop. 2014 Ford F-150 Tremor with 2 door regular cab, 4 wheel drive, 3.5L V-6 engine, Perelli tires, & 10,253 miles and 1977 Chevrolet Corvette Stingray T-tops, automatic, bright yellow and 52,766 miles. 2007 Yamaha VS-6 Classic Cruiser 1,635 miles. 15’ flatbed single axle trailer. John Deere G 7245 20hp riding mower, MTD 5/24 5hp snow blower, 5500 watt Briggs & Stratton generator, electric power washer, Black Max 110 volt 3hp compressor, Craftsman woodworking tools include 10” table saw, 10” band saw, scroll saw & router, Craftsman tool chest, Ryobi compound miter saw, bench grinder, Olympia vise, shop vac, 24’ aluminum extension ladder, 6’ & 8’ fiberglass step ladders, hand, yard & power tools and more. Sumter cherry dining suite with double pedestal table, 6 chairs & lighted & mirrored china cabinet, 6-piece cherry bedroom suite with cannonball queen bed, dresser, 6-drawer chest, lingerie chest & (2) night stands, Queen Anne cherry end & coffee tables, 2 curio cabinets, mahogany secretary bookcase by Jasper Cabinet, clawfoot bedside bench, Tell City dinette table & 4 chairs, Tell City Young Republic rolling server, (2) cherry TV cabinets, 3-section bookshelf uit, oak end & coffee tables, (2) Adirondack chairs, computer desk, leather recliners, electric recliner, mirrored hall tree, (2) burgundy Queen Anne recliners, (2) stools and more. Ornate cherry Ridgeway tall case clock. Maytag Centennial washer, GE washer, Magic Chef apartment size refrigerator & chest deep freezer. Viking Spas outdoor hot tub with cover. Ray Day “Pumpkin Patch” framed print, Terry Riddle prints “Prepared for the Season” & “The Pleasure of Winter”, “Sunday Morning”, “Sleepy Hollow” & “Berry Pickers” etchings by Jas. S. King. Sharp 52” flat screen TV, pressed glassware, china, brass floor & table lamps, bisque figurines, Norman Rockwell cups & plate, china horses, brass deer, kitchenwares, small appliances, World Rhythm clock, Brinkmann gas/charcoal smoker grill, golf clubs, folding Lifetime 6’ table & (6) chairs, Proform treadmill, Stamina 885 exercise bike, free weights, Christmas decor, trains & tracks, JVC turntable, large selection of Elvis 33 RPM records and more. I-64 to Greenville Hwy. 150 Exit#119. West 1 mile to left at light on Old Vincennes Road. 1 1/2 miles to left on Vale Hill Drive to 2nd house on left.